Ergonomically designed with your baby’s needs in mind from day one, this is a fabulously soft and snug style bouncer that will safely cocoon your precious baby from infancy right through to their toddler years. With a natural bouncing movement, this will also encourage and assist with your baby’s motor skills and balance. Combining both the functionality of a baby bouncer and a Chair in one and with four different positions to select, your Babybjorn Bouncer can be used for play, rest, sleep and transport, meaning that it’s truly versatile and adaptable for all your needs. It’s also a very sleek, chic and stylish looking bouncer that combines practicality with great looks and features. This is a truly versatile piece of baby equipment that will not only help develop your baby’s balance and motor skills, but with no batteries, plugs or charging required, is also a very safe and easily transportable piece of essential baby kit. Made of 100% cotton, it’s both soft and supportive at the same time for your delicate baby’s needs, providing essential support for the neck and back muscles. Featuring a natural, bounce movement, it combines 4 different reclining modes making it the perfect bouncer for play, rest, sleep and on the move. Better still, it also folds completely flat when not in use, meaning its even handier when it comes to transporting you, your baby and all their essential gear around. The Babybjorn Bouncer Balance is the ultimate adaptable and comfortable Bouncer and Chair in one which you can use from day one right through to early toddler years. It is super soft and stylish with a sleek and chic design. This is the perfect product for a family that likes to be on the move, visiting friends and relatives with their new bundle of baby joy. With its fold-down flat-storage capabilities and its four positions, it’s great for a family on a budget and those tight on space who don’t have the money or the storage room to be investing in lots of different pieces of essential baby equipment. This is a quality bouncer as you would expect from the respected team at Babybjorn and as such is fully certified, safe, ergonomic and supportive. It’s a great choice for a new family. Your Babybjorn Bouncer comes with a harness and padded seat and is quick and easy to assemble and when not in use can be folded completely flat for easy transportation and storage. It also features reversible fabric transforming it from a Bouncer to a comfortable Chair. The Babybjorn Bouncer Balance Soft is stacked with features that both you and your baby will just love. First up, its made from 100% cotton so its soft while at the same time providing a snug design that will safely support your newborn. It also features a special ergonomic design which helps your baby to quickly master for themselves the art of rocking and bouncing back and forth. This means that you baby is fast on their way to increasing both their balance and their motor skills, essential to the early stages of their development. That same ergonomic design also means that the bouncer will mold to your baby’s body which is a great feature during the formative months when a babies muscles are still growing and developing. There’s proper head, back as well as neck support taking you from newborn to 2 years old. The design is clean, functional but also versatile. The Bouncer Balance Soft is actually reversible so as your baby grows, you can transform your unit from a bouncer to a comfortable and relaxing chair position. The safety harness is also made of lovely soft padded fabric so that it’s comfortable for your baby to grip and hold. Speaking of positions, this Babybjorn model has 4 different reclining positions, which means it’s just as good for rest as it is for play. It couldn’t be easier to adjust; it’s also quiet so won’t disturb your baby. plus when you’re not using it, it stores completely flat for easy storage and on-the-go portability. Easy to clean, fully machine washable and made of certified non-hazardous material, this unit is fully certified and has been developed alongside leading pediatricians to ensure correct posture and alignment is maintained. It is expensive but it is multi-purpose and the features are reflected in the price point. It’s also fully baby powered not motorized, so if you are looking for a model that has an additional vibration function and is also very budget friendly, take a look at the Bright Starts Bouncer. 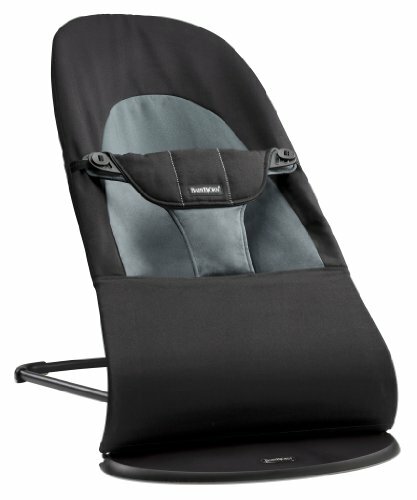 With its easy fold flat function for storage and transportability and its various reclining positions that take you from rest through to play, this ergonomically designed Bouncer is comfortable, versatile and multi-functional. Suitable a for newborn up to 2 years old, it’s chic, sleek, stylish and neat and will be loved by your baby as much as it is by you.